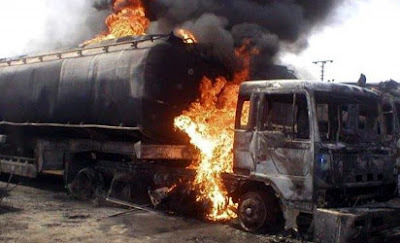 Tragedy struck on Monday at the Petroleum Wharf, Apapa, Lagos State, after an explosion at the jetty killed four people. Punch Metro learnt that a vessel, identified as Histria Ivory, was discharging Premium Motor Spirit (petrol) around 3am when some hoodlums besieged it to scoop fuel spilling from the vessel. The activities of the hoodlums were to have caused an explosion, which resulted in the death of four people. Officials of the Lagos State Emergency Management Agency, men of the Lagos State Fire Service, Federal Fire Service, Nigerian Ports Authority and the Nigerian Navy were said to have been called when the jetty’s in-house fire unit could not handle the inferno.